Scan van een kleurenafdruk; foto gemaakt op een grijze middag op Duxford, 23 mei 2004. Dave Ratcliffe brengt de Merlin 266 op temperatuur. Built against contract No. B981687/39 at Castle Bromwich, c/n CBAF.IX4262. 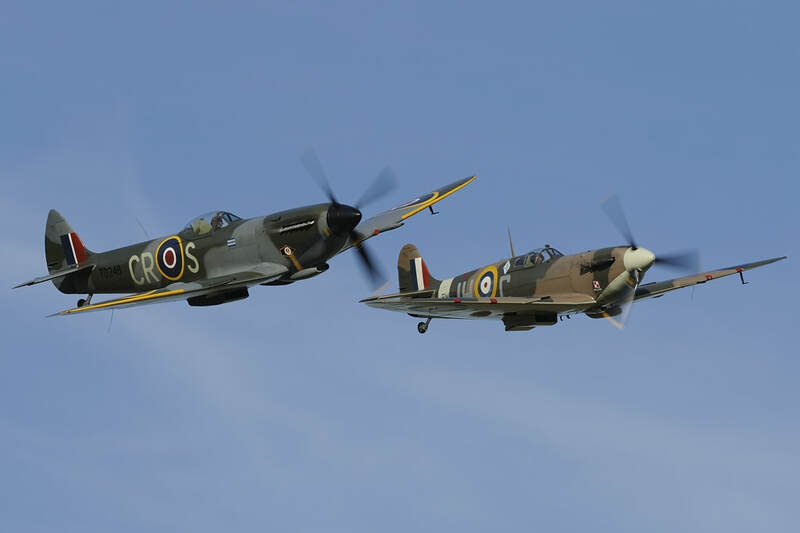 Taken on charge by the RAF in 0545. Delivered to RAF (6 MU) on 110545; Arrived at 6 MU at RAF Brize Norton on 160545. Prepared for service for 695 (Army Coop) Sq at RAF Horsham St. Faith, code '8Q-T' allocated. Noted with this unit in 0745. Damaged on 311247; for repairs to 54 MU (Cambridge); rejoined 695 Sq on 130548. Transferred to No. 2 CAACU at RAF Little Snoring on 310851 until 1954. To 9 MU, RAF Cosford on 270554 for storage. Declared non-effective airframe on 141254. Issued to 610 Sq RAF Hooton Park as gate guard from 041055 until ..... ; coded 'DW-A'. Stored at RAF Hooton Park (1957-1959). Allocated to No. 1366 Sq, ATC, on 080459 as 7246M. Moved to RAF Sealand on 310167 for 30 MU. Noted at RAF Henlow for Battle of Britain movie (1967/68). Placed on display outside Officer's Mess, RAF Sealand (...). Refurbished in 1975. RAF Sealand as gate guard (...), mounted on plinth near main gate (1979), coded 'DW-A'. Released by MoD in exchange deal with Historic Flying Ltd., Audley End (0688). TD248 arrived at Audley End from RAF Sealand on 141088. Reg. G-OXVI on 220889 for Eddie K. Coventry/BAC Aviation Ltd., Earls Colne. Raw started in 1990. Ff on 101192 from Audley End by AVM John Allison. In silver overall c/s with red cheatline, coded 'D', representing an F.21 used by 41 Sq during 1946 (see below). To Karel Bos, Braschaat, Belgium. Intrepid Aviation Company. For sale in 2000. Crash landed at Duxford on 100501. Pilot Karel Bos escaped with minor injuries. A/c damaged extensively. Ff after repair on 270502 by John Romain. A/c in colours of an F.21 of 41 Squadron, believed to have been the personal a/c of AVM T.C. Traill, serial believed to have been LA214 or LA232. ‘HF-L’, grey-green c/s with D-Day striping, f/n on 230504 at Duxford. Regained silver c/s by 280804, noted at Southend. 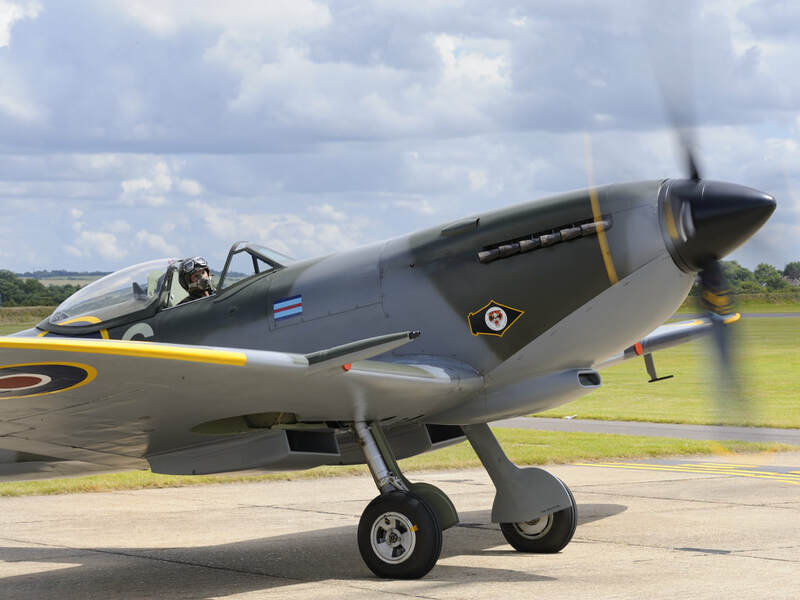 Sold in mid-2005 to Duxford based consortium Spitfire Ltd.
Repainted in grey/green c/s, ‘CR-S’, 74 Sq; personal markings of AVM Cliff Spink. Aw at Duxford, last noted 150718.